Turbo Club Apartments, Maspalomas, Gran Canaria Free Child Places Low Deposit Family Holidays @ Web2travel Deals. Finding the Best Value Holidays to Gran Canaria from UK airports. 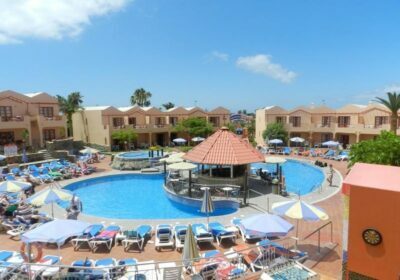 The 3 star Turbo Club Apartments is a popular choice for budget holidays in Maspalomas, Gran Canaria. Rooms are basic but spacious and very clean. Staff are very friendly and helpful. Although there are limited choice of dishes, food is fine and you will find something for everyone. Courtesy bus to Maspalomas beach. Great choice for family holidays. Good Value for money. Deals from Multiple Travel Companies for all Maspalomas, Gran Canaria Holidays. The Turbo Club Apartments are in Maspalomas and are set 3.5 km from the sand dune and 1 km from the Faro II shopping centre. Please note that the apartments operate daily bus service several times a day to Maspalomas beach. The Turbo Club Apartments offer 2 swimming pools, children’s pool, sun terrace, sun beds, jacuzzi, floodlit tennis (local charge), children’s playground, pool tables (local charge) and mini golf (local charge). The hotel offers reception, internet access (local charge), restaurant, pool bar and a mini market. There are games and competitions and a variety of sports and fun. The complex offers 120 apartments (each approximately 32 sq. metres). Each benefits from separate bedroom, combined sleeping area (up to 3 guests), kitchenette, safety deposit box (local charge), satellite television (local charge), private bathroom and balcony or terrace (with garden furniture). Please note that baby cots are available on request and count as 1 person in the room and are not in addition to the maximum occupancy. The apartments are situated 30 km from the airport.